If the opportunity were available, would you get small on the chance to have a better life? Knowing myself, sure I would do it. 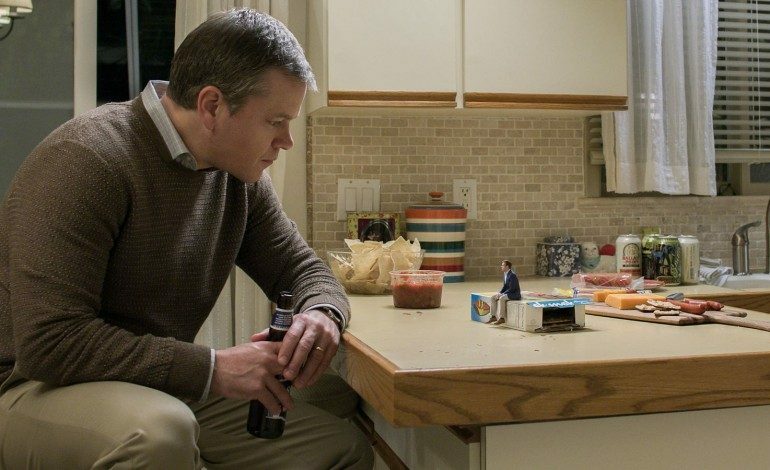 Downsizing has an interesting premise, but lacks direction in a story that starts off well and sinks further and further into moments that will have you scratching your head saying, “What is going on?” Director and co-writer Alexander Payne is known for utilizing smart scripts that bring great moments in his films, such as in Sideways and Nebraska, yet fails to do so with Downsizing. There’s little to be desired and ends in a result that is loaded with laughable acting, and is overlong and quite boring. We begin the story as a doctor (Rolf Lassgard) discovers a way to shrink a mouse that eventually leads to humans being able to become small, five inches tall in fact. At a presentation, scientists and people everywhere are shocked to see this amazement. People who are smaller live great lives, can have a family and prosper in their small communities. Whatever money you have can translate to even more if you downsize, and this is just the case for Paul (Matt Damon) and Audrey Safranek (Kristin Wiig). After some thought, both Paul and Audrey decide to visit Leisureland (which is kind of cool), one of several places where the small people live. Paul and Audrey decide to downsize and say goodbye to their family and friends. Only thing, Paul becomes small while Audrey backs out at the last second and leaves Paul, resulting in a divorce one year later. Bye bye Kristen Wiig, that’s the last we see of her. A little while later Paul meets Ngoc Lan Tran (Hong Chau) who was shrunk against her will and lives in a debilitating small community. We also get to meet Paul’s neighbor Dusan Mirkovic (Christoph Waltz). He plays loud music and loves to party with the ladies. I’m not sure if this was intentional but both Chau and Waltz performances are annoying and painful to watch. They give some truly horrible acting here and I just wonder if the script was purposely written for their characters to speak and act the way they do. As the film progresses, we lose a sense of wonder. What is it like to be small? What are the perks? Well, nothing it seems. Prices are lower to purchase things, which is nice, and the homes people live in are way too large for a family – we’re talking mega mega mansions, something that no one could ever afford, ever. Plus, the regular-sized people or people who didn’t downsize feel indifferent to the small people. They stare, they complain that things are cheaper for them. There’s even a moment when we hear that their votes don’t even amount to one regular vote from someone who didn’t downsize. The social angle in this film seems forced and nothing that the audience couldn’t already foresee. Downsizing started off great and while I would’ve wanted more of the science angle of how downsizing could be achieved, I was entertained for about forty-five minutes. After that, the film sank faster than a tiny hole in a row boat. Wigg, Sudekis, and even Neil Patrick Harris are hardly in the film and feel wasted despite being in the previews during its promotion. Downsizing has no sense of amazement in relation to a sci-fi films and the social satire feels too forced upon the audience for us to even care about the characters that we meet. Chau and Waltz are the worst part of this film and Damon’s character isn’t interesting or memorable. Downsizing fails at everything from a coherent and engaging story, stupid characters and a direction that isn’t focused enough to understand what it was going for in the first place. Downsizing is a colossal success at being a lackluster experience.